I love the idea of Isotype – I love the fact that it was an explicitly Social Democratic project to enable the citizens of the world to understand it and shape it, I love the fact that Neurath started out with a Museum of Society and Economics in the 1920s (this is a hobbyhorse of mine – why does such a Museum or some kind of Social Exploratorium not exist now?? ), and I love the modernist design of it. But on the other hand, there is a quaint clunkiness about the whole project, some of which may indicate limits of the diagram’s usefulness in trying to understand society, but some of which indicate Isotype’s historical moment, and the manner in which we have moved on. To set aside questions of the limits of the diagrams (problems of representing abstract concepts with pictograms etc), I want to consider the Isotype’s diagrams as indicative of their historical moment. First, the basis of the Isotype pictogram seems clearly to be the logic of the Fordist industrial paradigm – it is modernist. If a generic icon stands in for a wide array of objects, this is more problematic than when it stands in for something singular or without much variety. In relation to man-made objects (such as a phone or a car), Isotype’s rendering seems potentially more direct than today’s, because if all cars are of one model and black, then drawing a black car of the same type to represent all cars is to draw the actual car, not an abstraction of it – a picture, not a pictogram. Today, the diversity of the forms of phone or car mean that to a far greater degree, a choice of icon to represent the full category of objects will be understood as taking either a particular contemporary example to stand in for the full range of subtypes and variations. When we look at Isotype icons, we sense the kind of industrial crudeness of the original being represented, the limited range of consumer goods shown, and sense that our own products are of a very different kind. A kind of industrial Platonism is at work in Isotype that cannot account for today’s production. Of course, as well as having a less direct, more synecdochal, relation to its referant, an icon of a contemporary product would conote a different relationship to the subjectivity of the user, a more seductive, less functionalist kind of design would be evident. We would imbue into the icon, even the mundane aerodynamic curve of the contemporary car, a whole cosmos of advertising imagery, ergonomics and a sense of the affordances the product gives. We would see it as the representative of a kind of subjective experience as much as of a kind of industrial product. No doubt this is in part a question of historical distance: things from the past are seen as objects, because we are less able to bring our own experience to bear on them, we are less able to get inside them. But it is no doubt also because contemporary products are more concerned with subjective experience than Fordist manufacturing was. This attention to a deeper sense of subjectivity is clearest in Isotype’s representation of people. People are without features. While it’s arguable that this is in the nature of diagrams – to reduce to a simplified generic form – on the other hand, there is something within them which indicates the sense of the aggregate everyman defined by social class and function, within a Fordist industrial paradigm. It’s interesting to see in the book Problems of Human Industry, which is illustrated by Isotype, how they acknowledge the issue of boredom within Fordist factory work. They have a diagram that shows how an HR department can help allocate the worker to the most appropriate task suited to their abilities and character, hence reducing the Problem of Boredom. However, the manner in which the allocation is described and diagrammed comes across as being a fairly Taylorist, bureaucratic process, where the expert knows best about putting which faceless peg in which hole. Today, in the Post-fordist, flexibilised world, such a notion of allocation-by-expert would seem almost offensive. Instead, the generic image of the happy worker is that of the smiling stock photography of smiling co-workers dynamically pursuing whatever goal they determine themselves in entrepreneurial or self-expressive modes. A tension within contemporary Post-Fordist diagramming has to be the degree to which a sense of the particular individualises or subverts the generic abstraction of the pictogram. Look, for example at Xplane’s work (the little you can see of it on their website). Perky little people of a variety of ethnicities and in a variety of clothes. Their stylisation may indicate a degree of conformity to the disciplinary requirements of the workplace, but in their slick aerodynamic ironic form, these include, as well as diligence, dynamism and creativity. 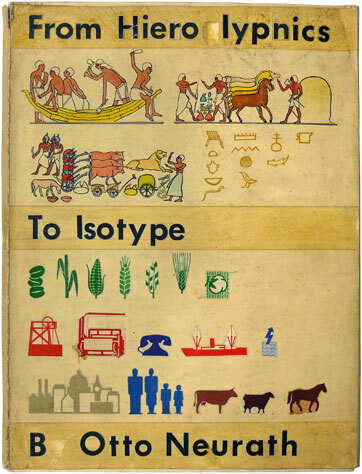 It is interesting to note the shift from the hieroglyphics to the Istoptype icons: the Egyptians, though subjected to their own conventionalised codes of representation and placed in the development towards Isotype as primitive as much as originary, the people are so much more full of life than the Neurath’s sombre blue Fordist family. A critique of modernist progress seems barely repressed within the images. A second aspect of the historical particularity of Isotype is the overall organisational structure of the diagrams. They often take the form of statistical charts, or of linear or hierarchical structures. This is clearly Fordist/Taylorist. From today’s point of view, there is a sense that the notion of the network is missing.The Xplane people work together in three-dimensional colourful space, within which the enact with a range of dynamics. The story of the change from Isotype to Xplane is the story traced by Boltanski and Chiapello’s The New Spirit of Capitalism, from the hierarchical reach of the company men to the creative portfolio careers of the new age networked project workers. From a historical point of view, a number of questions arise about the nature of the contemporary situation. First, many people view the new world of work as more fulfilling than the Fordist paradigm – that in effect progress has occurred by value of escaping the unilinear model of progress pursued previously. But we have to ask, is this progress as such, or is it just different, with losses as much as gains. When we look at Isotype people and Xplane people, we bring a different set of associations to them. When we look at the Isotype family, we think of the mother preparing the home for the arrival of the father from the office. They will eat meat and two veg for dinner, and father and mother will listen to the wireless when the children are in bed. Where the Isotype people may be bored at work, they may also see a clear separation between the sphere of work and their home lives, work may not reach into every aspect of life, and they may have been more able (through their aggregation into unions and so on) been able to argue for better pay. When we look at the Xplane people, we think more of the gym, of lattes, of internet dating and of people whose whole lives are subject to email, and the need to give more of their soul to their work than perhaps they really want to give. Flexiblised and surely without unions representation, they are paid less. They are the subjects of the left wing critiques of affective labour. Chris Ware may be the diagrammer of the down side of this contemporary vision of subjectivity. Second, the use of the network within Xplane, but also within research methodologies such as Social Network Analysis, is a powerful analytical and representational tool. No doubt this is the case, but our tools are not ahistorical. The cult of the network itself reflects our socio-economic paradigm: a flexibilised social form emerging from isolated individualised nodes. Both of these questions have implications for diagramming different eras – would it be anachronistic to diagram the 1940s worker as a quirky individual in a networked social form? ← What would Isotype look like today?